In the Midwest, Seasonal Affective Disorder (aptly known as SAD) is a real issue. 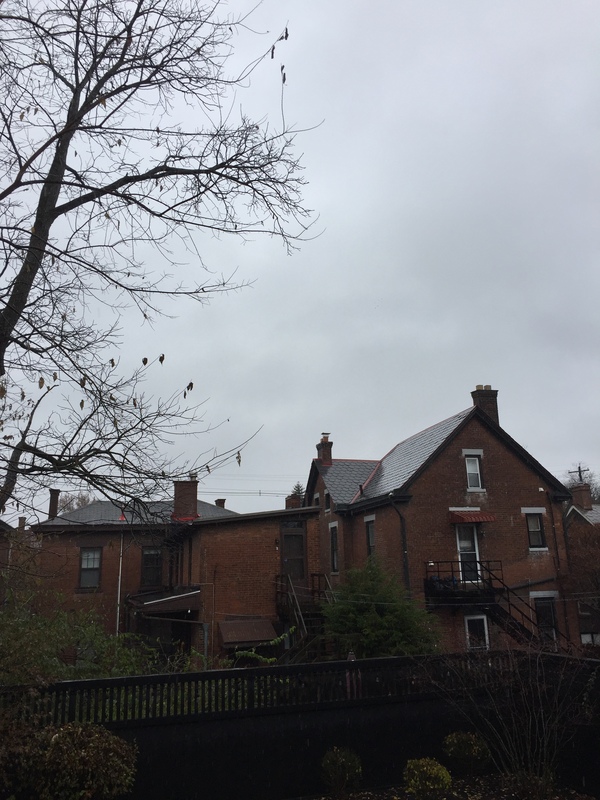 During the months between November and March, when the days are short and the skies are almost unrelentingly gray and gloomy — like this picture I took on Saturday from our back steps — lots of otherwise sturdy and resilient Midwesterners find themselves down in the dumps and absolutely sick to death of overcast weather. Scientists are taking SAD seriously and have conducted several studies of the condition. The data indicates that about five percent of Americans experience SAD — I’d be willing to bet that the percentage is a lot higher in the Midwest during the winter months — and women are about four times as likely to have the condition as men. And now a study has concluded that people with brown eyes may be more likely to experience the SAD symptoms. The study also indicated that blue-eyed people, in contrast, are less affected by the lack of sunlight. Why would eye color matter? Sunlight affects mood and vitality through the eyes. The author of the paper about the study hypothesizes that “the blue eye mutation was selected as a protective factor from SAD as sub-populations of humans migrated to northern latitudes.” The mutation that led to blue eye color occurred about 10,000 years ago and was thought to simply be associated with “the general package of pale skin in northern latitudes.” The scientist now thinks that “given that frequencies of blue eye coloration reach their highest proportions in the most northerly latitudes of Europe, and given SAD rates reach their highest figures at the most northerly latitudes, then another possibility is that the blue eye mutation is maintained in such areas in order to alleviate the effects of SAD.” In short, in the northern climates natural selection may have advantaged people with the blue-eyed mutation because they were more capable of dealing with the gloom than their brown-eyed friends and therefore were more likely to survive and reproduce. It’s now the SAD season in the Midwest. Fortunately, I’m not brown-eyed. My eyes are a bright burnt sienna, and I’m not prone to SAD. But lots of people around here are, and I sympathize with their reaction to the grayness. Many Midwest snowbirds head south not so much in search for warmth as in search for sunlight.